Evaluation of the original ParticipACTION campaign effects focused on individual awareness, recall, and understanding. Less studied has been the impact such campaigns have had on the broader organizational capacity to mobilize and advocate for physical activity. With the relaunch of ParticipACTION, the purpose of this study was to qualitatively explore baseline organizational capacity to promote physical activity messages, programs, and services within the Canadian context. Using a purposeful sampling strategy, we conducted semi-structured telephone interviews with 49 key informants representing a range of national, provincial, and local organizations with a mandate to promote physical activity. Interview data were analysed using a thematic analytic approach. Key informants painted a generally positive picture of current organizational capacity to promote physical activity messages, programs, and services in Canada. Will and leadership were clear strengths while infrastructure limitations remained the greatest concern. Some specific challenges included: 1) funding issues: the absence of core funding in a climate of shifting funding priorities; 2) the difficulty of working without a national physical activity policy (lack of leadership); 3) inconsistent provincial and educational sector level policies; and 4) a persistent focus on obesity rather than physical inactivity. The data generated here can be utilized to monitor the future impact of ParticipACTION on enhancing and utilizing this organizational capacity. A range of indicators are suggested that could be used to illustrate ParticipACTION's impact on the broad field of physical activity promotion in the future. Most evaluative studies of social marketing campaigns and organizations promoting physical activity have tended to focus specifically on individual effects and message recall . Bauman and colleagues  highlight the need for evaluation focusing on the impact of such campaigns on 'gatekeeper' groups such as policy makers, health professionals and advocates, and industry . Less studied has been the impact these campaigns have on the broader organizational climate to mobilize and advocate for physical activity or on how existing organizational capacity is utilized by a new social marketing initiative to achieve its own goals. We suggest that increases in physical activity promotion, advocacy, and delivery capacity (intra-organizational, extra-organizational and inter-organizational) may be a critical intermediate level outcome of the new ParticipACTION and its future initiatives. The process of building capacity is an important dimension that fundamentally adds to the actual outcomes of health promotion . The achievement of changes in long term outcomes, such as increases in population levels of physical activity, often takes years. The tracking of intermediate level outcomes, that indicate long term progress is being made, is therefore essential. Indeed, a broad objective of the original ParticipACTION was to influence decision makers and organizations to develop friendly infrastructures and supportive environments for physical activity with the consensus being that the original campaign was successful in creating "a more receptive climate for the institutional changes needed to help Canadians adopt physical activity" (, page S24). However, no systematic evaluation was conducted to support this conclusion. At the start of this current study, the new ParticipACTION was launched and prominently listed objectives explicitly related to capacity building such as becoming a leading, national catalyst; a communicator of practical information; motivator of coordinated partnership actions; and, contributing to community capacity building (see ). Identifying current capacity then becomes important in providing a basis for evaluating how ParticipACTION uses or influences opportunities or resources (e.g., organizational capacity) that may affect future physical activity levels of Canadians (e.g., changes in federal policy or school curriculum policy). Accordingly, two inter-related and sequential studies were conducted including 1) a web-based survey of national physical activity and health organizational capacity (see ) and then 2) the current one which is an interview-based qualitative study with purposefully selected key informants drawn from the web-based survey. Qualitative approaches are particularly appropriate for exploring the process of capacity development because change may occur in unanticipated ways . Knowledge about organizational capacity and its development is limited  although evidence suggests that key components of organizational capacity include coalition building, networking, planning, management, delivery and evaluation of programs, and acquisition and availability of resources to achieve mandates. Smith and colleague's  (see Figure 1) theoretical model is an existing framework for examining organizational capacity and was chosen in this study as the theoretical lens for exploring perceptions of current capacity for promoting physical activity in Canada. The model includes three capacity indicators: leadership (e.g., the process of developing partnerships, collaborations, and linkages within the community); will/policy making (the process of developing vision, mission, and political will of the target community to implement and sustain a health initiative); and, infrastructure (e.g., the process of developing a supportive system and organization in the health sector, and the skills, knowledge, and resources for health promotion). Drawing on experiences from the Alberta Heart Health Project, it was found that overall capacity for health promotion was strengthened when these individual dimensions, or their interaction, were increased . Further research informing the present study included the work of Joffres and colleagues  who offer a broader theoretical framework for organizational capacity that captures much of Smith et al's  capacity elements, referring to these as "internal context" but situates these in an "external context" (political climate, community awareness and interest, existing inter-organizational partnerships) which may challenge development within those dimensions. 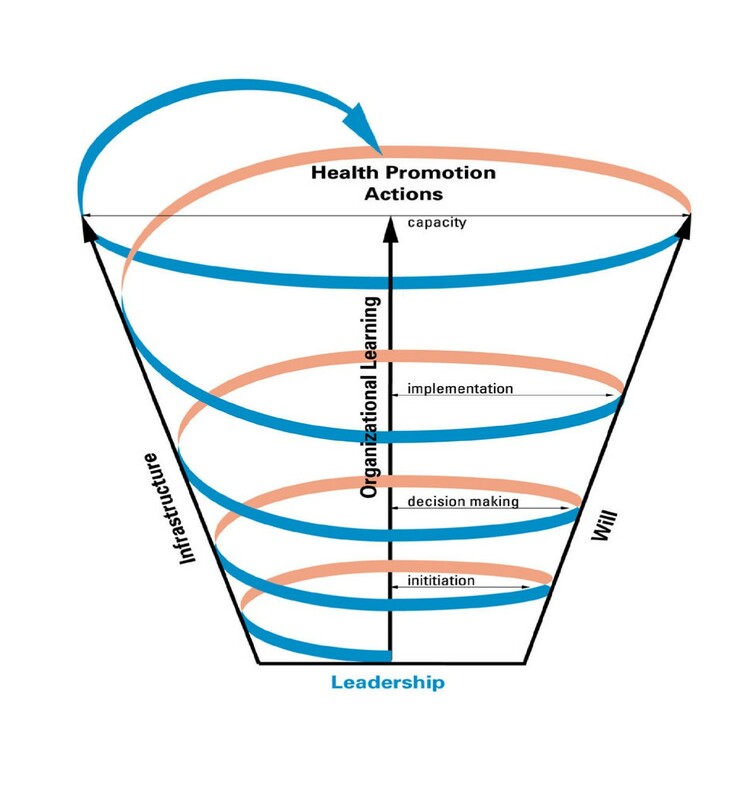 Model of capacity building for health promotion (; permission to reprint provided by SAGE). The purpose of this study was to explore baseline organizational capacity to promote physical activity within the Canadian context - by capturing a descriptive "snapshot" of organizational activities in the field of physical activity promotion in terms of will/policymaking, infrastructure, and leadership. This is the first qualitative study to our knowledge that establishes the foundations to examine subsequently the impact of a social marketing organization on physical activity promotion capacity at the organizational level. This qualitative, interview-based study involved 49 key informant interviews. Key informants were defined as individuals who have extensive involvement with, and knowledge of, their organization in relation to physical activity promotion. Informants were selected from a wide range of organizations engaged in physical activity promotion. Recruitment was linked to completing the web-based survey previously reported (for sampling details see ). At the end of the survey, participants (n = 268) had the option of providing consent for a follow-up interview. A subsample of 68 agreed to be contacted (response rate = 25.4%) and 54 were selected and sent email invitations: 34 agreed to an interview (cooperation rate = 63.0%). Since ensuring heterogeneity was a key consideration, participants were invited on the basis of ensuring that all province/territories, and organizational sectors and mandates were sampled. Some potential interview participants (n = 14) were not invited because there was over-representation from a) a particular province (Ontario), or b) the educational sector. To ensure broader representation, a further 15 participants who had not taken part in the initial quantitative survey, were invited to participate to ensure adequate coverage of all mandates and organizational characteristics . However, there was still an under-representation of informants from Quebec, and private-for-profit organizations reflecting the initial survey responses (see ). Ultimately, 49 individuals were interviewed and this sample size is comparable to qualitative components of larger projects examining capacity for heart health promotion . The organization level breakdown included: 24 national organizations with some overlap between provincial and national levels in three of these groups (coded N1-N24); 19 provincial level organizations (coded P1-P19), and; 6 local level organizations (coded L1-L6). Semi-structured telephone interviews were conducted, ranging from 30 to 60 minutes. An interview guide was developed to explore perceptions of current capacity and was pilot tested with two individuals working in the physical activity field (for a national physical activity organization and a provincial educational organization respectively). Pilot testing generated constructive feedback on the content and the format of the interview. As others have reported, there can be difficulty in talking about "nebulous concepts such as collaborative building and advocacy" (, page 46) and both individuals found describing the capacity of their organization difficult without the addition of explicit prompts in suggesting examples related to will/policymaking, infrastructure, and leadership. Accordingly, the interview guide (available on request from the first author) became more structured in addressing these three major dimensions of capacity development (see ). These dimensions were each described and participants were asked to "describe your organization's current capacity to promote physical activity" given each definition. Further interview questions asked informants to discuss their organizational successes, barriers/challenges and suggestions for enhancing their organizational capacity. Discussing what might improve organizational capacity served as an indirect way for participants to think about potential dimensions of capacity in general. Interview data were analyzed using a thematic analytic approach. Thematic analysis is a process of induction that involves the identification, coding, and organisation of themes arising from the raw data. The audiotaped interviews were transcribed and scrutinized by the first two authors through a process of close reading in order to be immersed in the data and understand participants' perceptions. Key ideas or recurrent themes were initially listed and inductive analysis was used to identify, code, and organize themes arising from the raw data with quotations serving as units of analysis [15, 16]. Interview transcripts were broken down into discrete units by the second author and coded within each transcript with each based on the actual words of the respondent. These codes, tagged by initials, page and line numbers, were then examined and organized into themes with the three dimensions of capacity serving as an organizing template for categorising the emerging themes. This process was assisted by using the program QSR NVivo 8. This program supports the process of coding data in an index system with each unit of text indexed to a specific thematic, index heading. Additionally, this index system also facilitated the searching of text for patterns of coding and complemented the use of the constant comparative method  in comparing and contrasting each coded data unit to allow categorization into new themes. Using this constant comparison approach across responses from all of the informants assisted in the development of "plausible interpretations" from the data  regarding the most frequent subthemes. The subthemes concerned informants' discussion of capacity in specific relation to each of the three dimensions of will, infrastructure and leadership. As recommended by Guba and Lincoln , a number of strategies were employed to enhance the trustworthiness of interpretations in terms of credibility, dependability, confirmability, and transferability. Credibility was developed through purposive sampling and regular peer debriefing among the first three authors, and then among the rest of the research team in continually reviewing and discussing findings to examine alternative possibilities, and ensure informant perspectives were appropriately reflected in the results. Dependability was primarily developed through a form of investigator triangulation in which a subset of interviews (10%) was coded by the first author to assess coding dependability . Coding was found to be consistent although there were instances where discussion was required to reconcile differences regarding the centrality of certain themes that were coded. Specifically, broader themes were identified that captured informants' perspectives on their expectations of the new ParticipACTION and the challenges facing this re-launched organization. For ease of presentation, these perspectives are not reported here. In an adapted form of member-checking, credibility and confirmability were further developed by sending a draft report of the findings to each informant inviting comment regarding how well the findings captured their own experience and any further observations that might be important to the interpretation of the findings. Although there are concerns with the notion of member checking , this is an important step for us in knowledge exchange and sharing the findings with participants. We received three responses commenting positively on the paper. A further criterion is transferability and the degree to which the results of qualitative research can be generalized or transferred to other contexts or settings . By describing the key themes with extensive quotes from participants we hope to provide sufficient detail here to allow the reader to consider whether or not the experiences reported here are transferable to their own contexts related to physical activity promotion. The results are presented by first summarising findings related to each of the three capacity dimensions (will/policy making; infrastructure; and leadership) and then identifying the specific subthemes related to each. The current research found high levels of will and motivation to engage in physical activity promotion. Over ninety per cent of participating organizations have some mandate to promote physical activity and/or are involved with chronic disease prevention. In this section, we discuss how 'will' to promote physical activity was best characterized by participants through their explanations of policymaking successes; and by a broader societal and political climate interested in physical activity initiatives. These conditions have in turn facilitated the broadening of some key organizations' mandates to include physical activity initiatives. However, some challenges remain in policy development illustrated by gaps in school policies across the country, and at a more comprehensive level, a lack of a national physical activity platform or policy. Overall, organizations described achieving key aspects of their mandate by having policies and strategies in place; many others understand that "with policy comes funding" (N5) and have clear plans to pursue these avenues. Several respondents described provincial-territorial policies that have assisted in meeting the 2003 Federal-Provincial/territorial government adoption of the goal of a 10 percentage point increase in the prevalence of the population in each jurisdiction (province and territory) reporting participating in regular physical activity by 2010 (see the Integrated Pan-Canadian Healthy Living Strategy at http://www.phac-aspc.gc.ca/hl-vs-strat/index.html). Flowing from these policies are plans for delivering new physical activity programs whether through non-government partners or municipalities. There was awareness and interest in setting policies to contextualize and focus physical activity efforts. This might be indicative of a wider climate where physical activity and obesity was perceived to be on the 'national agenda'. Increasing societal recognition of the importance of physical activity has in part meant that a growing number of organizations have extended their mandates and business plans to be more inclusive of participants from a wide range of physical activity backgrounds. Two competitive sport-focused organizations described their efforts to attract and support a wider base of participants. This inclusivity was partly explained through the adoption of the generic Long Term Athlete Development (LTAD) model, known as Canadian Sport for Life by federal-provincial/territorial ministers. Participants described LTAD's concept of 'Playground to Podium' in broadening the definition of physical activity and sport to encompass sporting excellence as well as overall well-being http://www.canadiansportforlife.ca. Only that one of our key strategies is a healthy population. So that anything we do - physical activity is not specifically mentioned in our broad mandate, because it is a very broad mandate, but it comes under our key result areas, like healthy population....we'd like to be involved though our capacity is fairly limited, but certainly the will is there, and the belief in the importance of ParticipACTION is there" (N16). Although policymaking has made positive steps at all organizational levels, supported by the increasing recognition of the importance of physical activity, respondents were concerned about government mandates that may shift with political party changes. Disjointed physical activity school policies were a recurring theme across all organizational levels. The majority of respondents highlighted concerns within the school system, complicated by variance across the provinces and territories. One national organization working closely with the educational field cited the jurisdictional challenges, as education is a provincial responsibility. Common challenges included the loss of physical education specialists and the ongoing neglect of physical literacy against core subjects. A few participants "want to move up the scale of priority" (P16) and receive the commitment of resources to deliver physical activity/education mandates. One provincial respondent suggested that affecting change has been limited by a lack of interest at the Department of Education level. Despite the repeated calls to action on the obesity and inactivity issue, participants stressed that school and community access policies have been an ongoing battle for many Canadian jurisdictions and requires more collaboration and strategic thinking between school boards and municipalities. Repeated calls were made to advance the physical activity agenda through some type of national strategic partnership. Overall, organizational will is strong among all organizations with some concerns for the intricate jurisdictional issues in the educational sector: participants pointed to the need for more collaborative partnerships and strong leadership at the national level. Infrastructure, the second capacity building element, is of critical concern to organizations as they deal with the complexities and idiosyncrasies of funding, human resources and knowledge transfer. In this section we discuss how infrastructure was primarily considered in the context of financial and human resources. This required expertise in accessing funds in the context of funding instability, and concerns about shifting funding priorities. Funding challenges could be partly addressed given existing human resource strengths although difficulties in staff retention remain. Funds have been generated from a range of sources but overall many respondents discussed the funder instability that is making it increasingly difficult for organizations to effectively deliver their physical activity mandate. Funding challenges are further hampered by increasing competition for money between like-minded organizations. Sole funding from the corporate sector was also identified as a concern in that corporate mandates may not fit the organization's goals/mission, or these funders may only support programs that can show their brand or logo, with little or no interest in advocacy work. "The research, the creative work, all of that stuff is astronomical in price, and we're all trying to do it on our own. If I could keep that half a million dollars that we spend on social marketing development and put it into programming, we would be so ahead" (P14). Providing heavy subsidies, for example, to coaching and leadership training ensured that one local community gained the necessary expertise and continued the local commitment to physical activity initiatives. Such efforts are ensuring that community-based, long-term physical activity strategies are rooted in local needs: "it's giving them some arms and legs to be able to do things" (P18) and "it still means the folks locally have to take it on and embrace it" (N11). Similarly, research on heart health promotion initiatives in three Canadian provinces found that increased staff focus on community mobilization and ownership to sustain activities ultimately served to enhance local organizational capacity . Time management and "multiple demands" (N4) were common concerns for both paid and volunteer staff. Participants discussed time constraints differently with one organization having, "little time to think" (P13) and cited repeated delays in their plans to review their mission and goals; multiple duties and a concern with delivering "practically-oriented" activities prevailed. One small organization found it difficult to keep an "eye on the entire physical activity environment" (N13) and figure out what will be the next physical activity trend. This comment introduces both the importance of leadership capacity and its complexity, in part because of links between human and financial resources. Overall, the majority of national organizations viewed their current leadership ability in positive ways with strengths in a wide variety of areas. In this section, we will discuss how leadership was described in terms of productive and collaborative partnerships although such partnerships were not always without strain; and through developing a greater role in terms of advocacy. There were existing inter-organizational partnerships that drew across a number of sectors and mandates. Partnerships with organizations sharing physical activity mandates and targeting a wide range of issues such as disability, aging, youth, girls and women, physical education, and tourism were common. Broad federal government departments and agencies have been increasingly joining physical activity initiatives (e.g., active transport). Partnering with organizations having non-specific physical activity mandates, "like-minded health-related organizations" (N8) have occurred and were described in this way: "We're a member of the Chronic Disease Prevention Alliance of Canada (CDPAC) because we think we have a lot in common with those specific health charities around the whole role of promoting prevention and healthy lifestyles" (N21). One national organization commented on increasing their partnerships: "individual provinces and municipalities are doing great stuff around physical activity. We want to be better able to share what they're doing" (N22). Another large national physical activity organization partners by offering in-kind services to low-resourced organizations. As with national organizations, provincial and local organizations also stressed the importance of having strong and extensive partnerships, a key indicator of leadership capacity. Finding people with the needed expertise, filling skilled positions, and retaining those people were difficult for rural, remote, and/or northern communities, however these effects were minimized when organizations readily shared resources. Thus, although "scrounging and borrowing" (P15) occurs in many of these communities, ultimately it is the intensive partnering efforts that prevail and aid in achieving physical activity mandates. All of these partnerships suggested strong potential leadership capacity in effectively delivering physical activity initiatives and setting the stage for further policy development and implementation. Strong organizational leadership qualities were also exemplified by organizations taking on advocacy roles, whether engaging in activities to change rules of governments or organizations, or other responsible bodies . Key stakeholder partnerships have emerged in advocacy efforts: "we've also begun to really work well with some of our provincial governments, around playing a role around coordination of public policy agenda" (N21). Several respondents expressed caution in partnering with non-physical activity organizations: a central focus on activity could be diminished or lost. As noted earlier, several organizations mentioned that a national voice for physical activity could play a central role in advocacy efforts targeted at all levels of government and in myriad settings (schools, workplace, home, communities). The new ParticipACTION could play that role. The purpose of this study was to qualitatively explore baseline organizational capacity to promote physical activity messages, programs, and services within the Canadian context. It is one of the first efforts to adapt health promotion capacity models to the field of physical activity and explore baseline organizational capacity to promote physical activity concurrent to the launch of a large-scale, national physical activity initiative. Overall, the organizational capacity model described by Smith and colleagues  was appropriate in framing current organizational strengths and challenges within the Canadian physical activity field and may be of use to international researchers investigating capacity elsewhere. Although the concept of "organizational capacity" was often perceived as vague by many informants, prompts in relation to will, infrastructure, and leadership added clarity to these discussions. Respondents enthusiastically shared organizational successes, challenges, and capacity strengths. In line with the results reported by Plotnikoff and colleagues , current capacity to promote physical activity in Canada could be described as good. Informants described a number of organizational strengths. A concentrated commitment to the physical activity field was evident in the wide range of policymaking efforts occurring across Canada, in part supported by the wider societal climate focusing on healthy initiatives and recently developed federal strategies and policies in both healthy living and sport. Such policy frameworks have enabled increased funds and other resources to flow into important physical activity initiatives. At the federal level, Barclay  found that the Canadian Sport Policy http://www.pch.gc.ca/pgm/sc/pol/pcs-csp/index-eng.cfm and Healthy Living Strategy http://www.phac-aspc.gc.ca/hl-vs-strat/index.html were deemed "hopeful signs" within Sport Canada and Health Canada (page 7) and our study suggests these federal directives are enabling organizations to address their mandates. Experienced leadership was a central factor in effectively delivering physical activity mandates. As a result of this leadership, there exists across Canada local, provincial and territorial partnerships working alongside key network and coalition groups. This has meant that complex physical activity issues are now being addressed, albeit not without some strain in these partnerships. The findings on partnership efforts also corroborate aspects of Interorganizational Relations (IOR) theory  in that socio-economic and political factors have been intricately woven in physical activity and health issues. These issues require partnerships between a wide range of sectors and at all levels, ultimately working to achieve policy objectives . For example, informants in our study highlighted innovative initiatives that illustrated such intersectoral partnerships (e.g., Commuter Challenge, active transport/built environment/smart-growth community initiatives). Resource sharing and resource acquisition  were also evident and web-based sharing and receiving in-kind services from more resourced organizations were described. Research partnerships have further enabled organizations to attain relevant and recent data to inform policies and practices, albeit not always relevant to local conditions and situations. Although human resource successes have been due largely to committed people working in both volunteer and paid roles, the physical activity field has been fraught with financial resource difficulties. Funding restrictions have negatively affected staff retention and training opportunities, further exacerbated by the multiple demands on staff which are often more pronounced for small, remote and/or northern communities. Several respondents focused on the difficulties of unstable funding. These concerns are reflected in other studies on the non-profit sector and funding practices [27, 28]. Eakin's  study was similar to our findings regarding the unreliability of funding as she explains: "funders are slow to approve/reject grants, and the slow response time causes 'gap' problems for service delivery" (page 4). Eakin concludes that "The administrative burden by funders on community non-profit organizations is so heavy and so unrelenting, and places so many constraints on their ability to operate that it is a wonder they can deliver any services effectively" (page 3). The current research also uncovered problems with funding reallocation from a population focus to current child and youth physical activity and obesity initiatives. An increasing number of organizations reported a limited capacity to meet their goals in the wake of such funder decisions. In contrast to the findings reported by Plotnikoff and colleagues  where educational organizations appeared to have greater capacity than other organizations, the majority of key informants (notably, most were not in the educational sector) expressed concerns with the inconsistency in school physical activity policies across the country. It was suggested that the potential role of schools could in part be bolstered by a more comprehensive national physical activity platform/strategy or policy. Such a national, multi-sectoral policy could result in a more coordinated approach to physical activity and provide pressure for a physical activity-centred agenda (see ). Participants suggested that organizations should proceed cautiously when selecting health partnerships because of the fear of losing key physical in/activity messages. Some did not wholeheartedly support obesity-centred research and program initiatives in the physical activity field. Participants in Barclay's 2003 Public Policy Forum paper , Finding Common Ground, corroborate some of these concerns in alleging that Health Canada places its lowest priority on physical activity promotion within the already secondary context of health promotion. Our findings highlight the fact that participants have similar concerns, with some participants critically examining the increasingly prescriptive approach to physical activity. Although collaborative work with other health mandates was welcomed, the prevailing concern was that physical activity is generally at a low priority in the larger health context and continued advocacy was required. Key informants in this study painted a generally positive picture of the current organizational capacity to promote physical activity in Canada. Will and leadership were clear strengths while financial and human resources remained the greatest concern. However, it may be that only those informants with generally positive perceptions agreed to participate in the study. Future evaluations could consider a range of indicators for monitoring how existing organizational capacity was utilized or indirectly enhanced by ParticipACTION, or other physical activity initiatives in the coming years. A first indicator could be the creation of a national physical activity policy or framework in the coming years. Such a public policy is expected to elevate the status of physical activity within the broader public health and health care climate and may positively impact the development of more comprehensive provincial physical activity policies for school settings. Included in this exploration would be tracking the process by which such a policy was developed: who were the major stakeholders (groups/organizations and/or individuals)? ; what was the major impetus for the policy creation (political and health conditions and/or forces at the time)? ; what other policies may have been influential during the policy-making process? ; has the policy been implemented in the intended manner?, and; what efforts were in place to monitor the policy's effectiveness? Assessing these factors would allow researchers to determine if various aspects of capacity led to development of policy in a concerted way or whether policy was developed independent of capacity. A second indicator might be the examination of partnerships, deemed by participants in our study as a necessity in physical activity capacity building. In line with IOR theory , monitoring partnership shifts over time is critical for fully exploring the process of capacity building. Examining existing partnerships through qualitative and quantitative means may uncover the following: what networks or coalitions remain, changed or have become obsolete during this period? ; what role will private/for profit organizations play as ParticipACTION embarks on securing broader bases of funding support (only one for profit participant was recruited for this study, a limitation that should be addressed in future research), and; what role did existing or new partnerships play in the creation of a national policy or platform for physical activity? A third indicator of growing national organizational capacity could be the changing contributions of large health organizations without explicitly defined physical activity mandates to the field of physical activity promotion. For example, based on their self-described strong organizational capacity, have they been invited to play a role in promoting physical activity? Specifically, how or will such organizations be engaged to commit long-term to the physical activity field? In what way and by whom? Since funding issues were a central concern for participants in this study, a final indicator could track funding process reform, as Eakin (, page 44) explains, in terms of "simplifying application processes, reducing the frequency and complexity of reporting, and speeding up the turn around time for grants". In the long-term, funding reform could minimize the administrative burden many organizations experienced. A sub-question to assess is the fate of organizations that experienced either reduced funding or ceased operations entirely. Have they been reinstated? If not, what gaps remain or have been addressed in physical activity promotion (e.g., subpopulations such as older adults) during the next decade? Furthermore, human resource issues should be assessed in light of funding constraints directly impacting on this area, most notably in the monitoring of paid and volunteer staff retention and the steps taken to alleviate these concerns in more remote or rural communities. These indicators could form the basis for future evaluations of organizational capacity for promoting physical activity in Canada. Ultimately, a longitudinal evaluation will uncover whether ParticipACTION or other initiatives successfully enhance or utilize existing organizational capacity to mobilize and advocate for a more active Canada. 1. This study was made possible by an Operating Grant (Intervention Research - Healthy Living and Chronic Disease Prevention: GIR 84128) from the Canadian Institutes of Health Research (Nutrition, Metabolism and Diabetes). 2. We would like to thank all of our informants for sharing their time and insight during this study. 3. LRB holds a Tier 1 Canada Research Chair in Physical Activity in Health Promotion and Disease Prevention. 5. LG holds a Canadian Institutes for Health Research/Centre de Recherche en Prévention de l'Obésité Applied Public Health Chair in Neighborhoods, Lifestyle, and Healthy Body Weight. None of the authors have any competing interests. LRB and LG are members of the Content and Collaboration Committee of ParticipACTION. MT was a founding member of the Board of Directors of the new ParticipACTION. GF, CM and RCP contributed to the design, data collection, data interpretation, and the drafting and the coordination of the manuscript. All other authors advised on the design, provided input at each stage of the manuscript draft and read the paper critically for theoretical content and interpretation of findings. All authors read and approved the final manuscript.